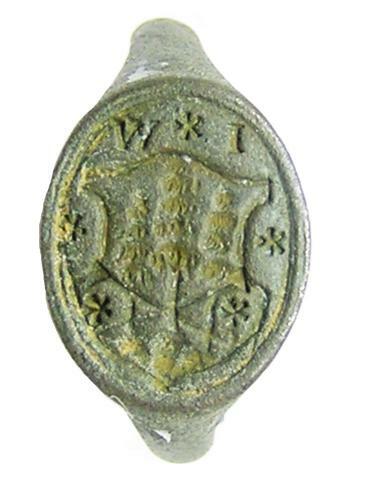 This is a very nice Renaissance bronze armorial signet ring, dating to the 16th or early 17th century A.D. The bezel is cut with a pseudo armorial device within a shield, this consists of trees in a landscape. The original owner's initials I.W. are displayed above. The ring is in excavated condition, it can be cleaned up if desired and will make a nice antique signet to wear and use.